Jake Grimm is a licensed authentic Montana outfitter (over 35 years), a member of the Montana Outfitters Association and Yellowstone Outfitter and Guides. Bond with nature, the horse and yourself! 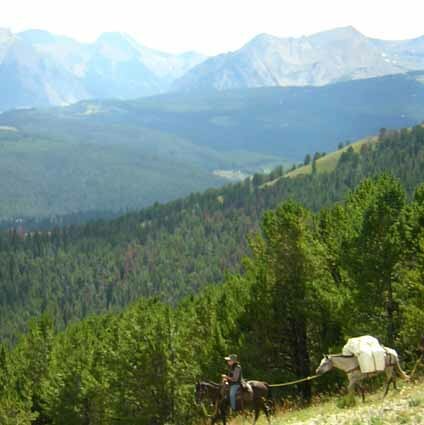 Experience Montana the way a horse sees it. Hour-long rides or as long as you wish, winter and summer! Experienced guides, scenic trails, steak fry dinner rides, reservations always preferred. Call 406-995-4630. Join our crew for a summer pack trip in and around Yellowstone National Park for a golden 'backcountry' experience. Book early! Fall hunting for the ultimate trip of a lifetime. Contact Jake about licensing, available dates and some good stories. Winter trail rides. Operating in the Gallatin and Madison National Forests, Lee Metcalf Wilderness and Yellowstone National Park. Join us!